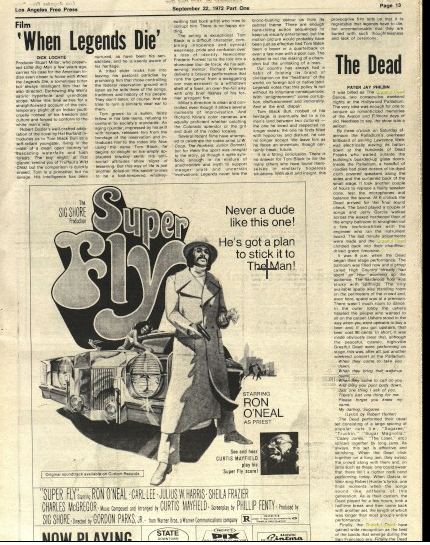 Fresh from the Berkeley Community Theater and Kesey's Farm shows, in September 1972, the Dead came down to Hollywood for two shows at the world famous (Hollywood) Palladium. Of course, it was boss. One note is that the shows were more similar to each other than most two night stands, but you can compare and listen here. 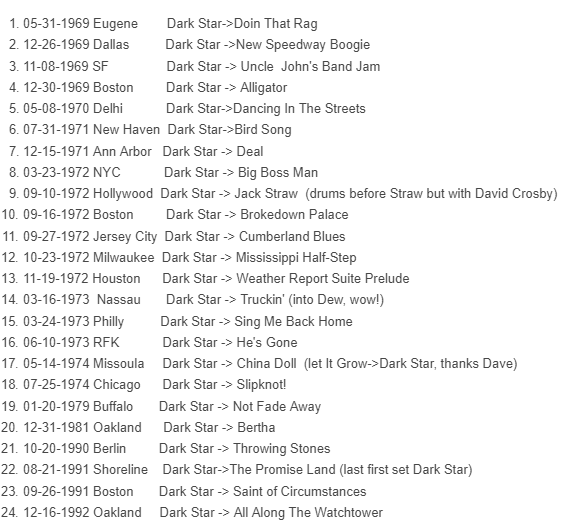 The highlight to me is the 32 minute long Dark Star that winds through drums into Jack Straw, the only time Dark Star went into Jack Straw. David Crosby helped it get there, playing on Star to the end of set two. We got two cool reviews, one from a college fan and one from the LA Free Press. They both seem to review the 9th which did not contain the monster Dark Star. 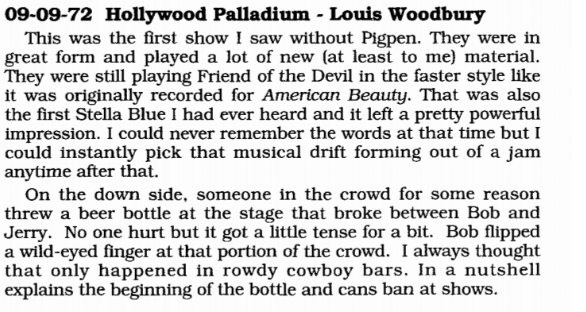 Clipping from Claremont Colleges student newspaper Student Life reviewing Hollywood Palladium shows 9-9 & 10-72. 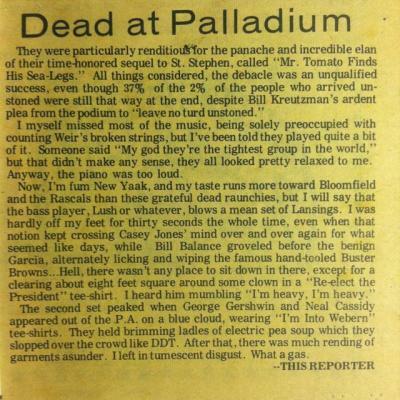 It was billed as The Grateful Dead Dance, two consecutive weekend nights at the Hollywood Palladium. The very idea was enough for one to conjure up romanticized memories of the Avalon and Fillmore days of old. Needless to say, the show was a sellout. By three o’clock on Saturday afternoon the Palladium’s overhead billboard of smiling Lawrence. Welk was electrically waving its batton down at the hundreds of Dead Freaks who waited outside the building’s boarded-up glass doors. Inside the Palladium, a handful of roadies had piled dozens of tie-dyed cloth covered speakers along the sides and the curtained back of the small stage. It took another couple of hours to replace a faulty speaker cone, test the microphones and balance the sound. At 6 o’clock the Dead arrived for the final sound check. The band played a couple of songs and Jerry Garcia walked across the waxed hardwood floor of the empty ballroom to straighten out a few technicalities with the engineer who ran the instrument board. The last minute adjustments were made and the Grateful Dead climbed back into their chauffeurdrived green limoisine. It was 9 p.m. when the Dead began their stage performance. The ballroom was filled now and a group called High Country already had spent an hour- warming up the audience. The hardwood floor was sticky with spittings. The only available space was standing room on the perimeters of the crowd and, even here, space was at a premium. There wasn’t much room to dance. In the outer lobby the ushers hassled the people who wanted to sit on the carpet. Ushers stood in the way when you went upstairs to buy a beer and, if you got upstairs, that beer cost 90 cents. In short, it was made obviously clear that, although the peaceful, cosmic, high-vibe Greatful Dead were performing on stage, this was, after all, just another weekend concert at the Palladium. When they come to take you down. When they bring that wake-up . round, When they come to call on you And drag you poor body down, Just one thing I ask of you, There's just one thing for me. Please forget you knew my name, My darling, Sugaree. (Lyrics by Robert Hunter) The Dead performed their usual set consisting of a large spicing of popular cuts (i.e., “Sugaree,” “Truckin,’’ “Sugar Magnolia,” "Casey Jones,” “The Loser.” etc.) spliced together by long jams. As always, this set is effective and satisfying. When the Dead click together on a long jam, they sweep the crowd along with them and, on jams such as these, one could swear that there isn’t a tighter rock band performing today. When Garcia or Weir sing Robert Hunter’s lyrics, one finds moments when the songs sound like anthems of this generation. As is their custom, the Dead played for a few hours, took a halftime break and then came back with another set, the length of which was longer than most group’s entire performance. Finally, the Grateful Dead have gained wide recognition as the best of the bands that emerge during the San Francisco era. Finally the Dead are in demand to play nationwide concerts for stadium-loads of people. 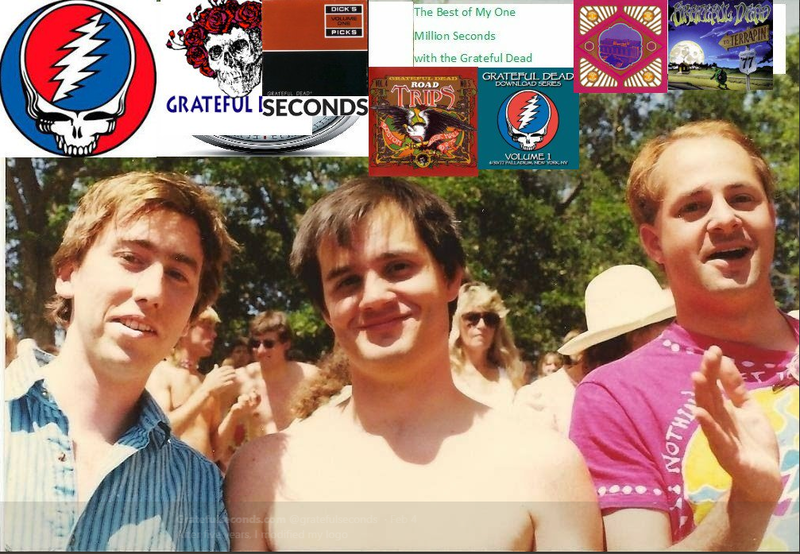 But, finally, it must be remembered that the Dead sprung forth as a local Bay Area band and, more than any other band, the quality and excitement of their show reaches its height in the San Francisco atmosphere. This chemical reaction is hard to explain and it is ever harder to reproduce on the road. 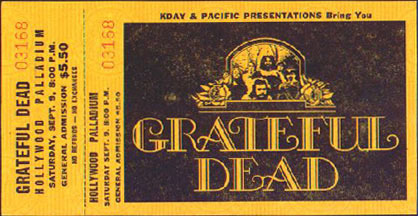 The Grateful Dead Dance at the Palladium was exciting, but there was no room to fantasize away from the fact that it was just another weekend concert in Los Angeles.